A Soshu Muromachi / Ashikaga era wakizashi signed Masahiro in shira saya with silk sword bag. A respectible Muromachi / Ashikaga era (1390 - 1572) wakizashi signed Soshu ju Masahiro. About 8 or 9 generations signed (Soshu) Masahiro from the Meitoku Era (March 1390 to July 1394) onwards. 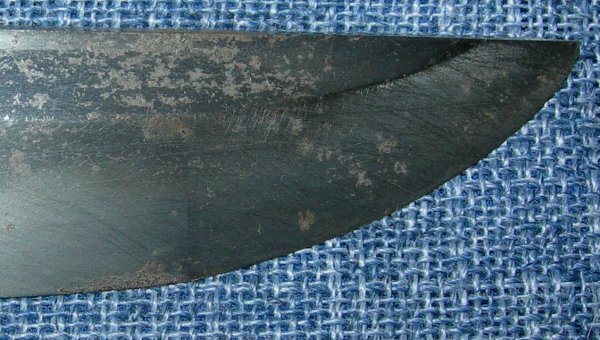 52.7 cm blade (Hatawrai - the cutting edge section of the blade) with strong Naka-Sugu Hamon. The blade has no discernable forging flaws but does have patina (stable black rust spots); nothing too deep, a very good candidate for a polish to create a speciman sword (I am happy to provide details of a good sword polisher). The wooden habaki has been broken and a piece lost; a simple item to replace. Further / full sized images available upon request.